The new Kayako is cloud-hosted help desk software that puts all your customer service channels in one place the better and more efficient way to address customer concerns (the classic on-premise Kayako is still supported). Trusted by over 50,000 organizations worldwide, used by 131,000 support pros serving 100 million customers, the software can serve a wide range of customer service needs, from small businesses to the largest companies. Among those customers trusting Kayako to provide their help desk services include NASA, De Beers, Peugeut and the American Motorcyclist Association. Among others, it supports live chat, tickets, web, email, calls or self-service support to help businesses further extend their help to their customers. Moreover, Kayako helps you look for insights based on customer queries, such as sales trends and opportunities, performance metrics, and support bottlenecks. You can also put your support in autopilot to fast track replies to standard queries or repetitive tasks so your agents can focus on addressing more pressing issues, or organize and route emails for easy sorting. 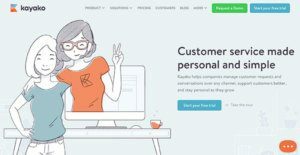 Through help desk and live chat solutions, Kayako helps companies manage customer requests and conversations over any channel, support customers better, and stay personal as they grow. Through robust API or ecommerce platform integration, Kayako provides strong support to ecommerce by displaying every page view and purchase history of the customer, as well as syncing it with the marketing or sales teams for more potential business from customers. Kayako features a mobile app for iOS, Android, Windows Phone, and Blackberry so you can provide customer service on the go. It’s also scalable that can match the pace of any growing business. Customers will search for answers on their own if you provide them the means. Kayako offers a 24/7 customer service via a brandable support portal, knowledge base, or intuitive answers as customers type in their question. Kayako takes on customization as never before: it allows support teams to customize ticket and live chat forms so these can be tailored to their specific workflow. Customer profiles can also be updated with custom fields, allowing for entry of additional information the moment a support request is made. Kayako automates repetitive and standard customer service processes with auto-ticketing, macros, notifications, and easy sorting so your agents can focus on delivering personalized support to high-level and more urgent concerns. Quickly check high-level issues or get all critical and relevant information so your agent can provide a more accurate feedback. Launch live chat across your website and address customer concerns fast or turn them into opportunities. The live chat gives you a real-time, proactive support to possible prospects. While automating frees up your agents from repetitive tasks, it also helps them to keep a high-level customer service standard by focusing on issues and concerns that need more attention. Even if the number of repetitive tasks increases a hundredfold, Kayako’s automation can handle them, so you can focus on reinforcing support for high-level customer calls. Furthermore, automate ticket routing ensures your customers are connected to the right agents fast to address issues quickly before they escalate. Kayako helps you check for trends and bottlenecks with its 100 out-of-the-box reports. You can also track performance and use the Kayako Query Language to create custom fields that measure your relevant metrics. Customize Kayako based on your corporate logo and colors. Also allows multi-brand support for large companies. Take your customer service on the go. Kayako is accessible via its mobile apps for iOS, Android, Windows, and Blackberry phones and tablets. What Problems Will Kayako Solve? 1) Slow customer connects response time. Kayako’s solutions instantly connect with customers, with a human touch. 2) Costly licenses for your business needs grow. Kayako offers payment solutions and support levels to scale with your growing business. 3) Losing track of the conversation. Kayako connects to multiple platforms, and devices, so your conversation can pick up across your customer’s media usage. It is important to note that virtually no software in the Customer Support Software category will be a perfect solution that can match all the needs of all company types, sizes and industries. It may be a good idea to read a few Kayako reviews first as certain solutions might perform well only in a very narrow set of applications or be prepared with a really specific industry in mind. Others might operate with an intention of being simple and intuitive and consequently lack advanced functions needed by more experienced users. There are also services that cater to a wide group of users and provide a complex feature toolbox, however that frequently comes at a higher price of such a software. Be certain that you're aware of your needs so that you get a solution that provides exactly the features you search for. We realize that when you make a decision to buy Help Desk Software it’s important not only to see how experts evaluate it in their reviews, but also to find out if the real people and companies that buy it are actually satisfied with the product. That’s why we’ve created our behavior-based Customer Satisfaction Algorithm™ that gathers customer reviews, comments and Kayako reviews across a wide range of social media sites. The data is then presented in an easy to digest form showing how many people had positive and negative experience with Kayako. With that information at hand you should be equipped to make an informed buying decision that you won’t regret. What are Kayako pricing details? What integrations are available for Kayako? Cons: We'd like to see more customization in the new kayako. Pros: Kayako offers good ticketing features. It is simple to set up agents and users. The knowledge base helps users to resolve problems on their own. The user portal is good as users can go to this place to create tickets and read knowledge base articles while creating tickets. It is flexible and easy to create knowledge base articles. We can create articles that ours user can utilize and this reduces the number of support tickets. We have used this feature to get rid of written documents which saves us money and time, and is a green initiative as well. Cons: Kayako does not integrate with remote support systems, which makes it difficult to find out which tickets were resolved with remote support help. Remote support sessions need different software and licenses. Google authentication is not used to create users and I believe we could have set up LDAP. If you need more information about Kayako or you simply have a question let us know what you need and we’ll forward your request directly to the vendor.